After we got back from Japan, I had a couple of days in Sydney visiting family and friends. I also got a chance to visit HobbyCo, which (I believe) is Australia's largest and oldest hobby store. I thought it would be interesting to compare Australian hobby shop to the incredible scale model stores I visited in Japan. HobbyCo is an institution in Sydney. It has been around for absolutely ages. I have fond memories of browsing there when I was a teenager back in the 1980s - they had a basement store on George Street across from the city cinemas, and I would go to see a movie and shop in HobbyCo. Later they moved to a big shopping centre on Pitt Street Mall, and I would browse there during my lunch breaks when I worked in the Sydney CBD. It's been a couple of years since I visited, so what's it like now? 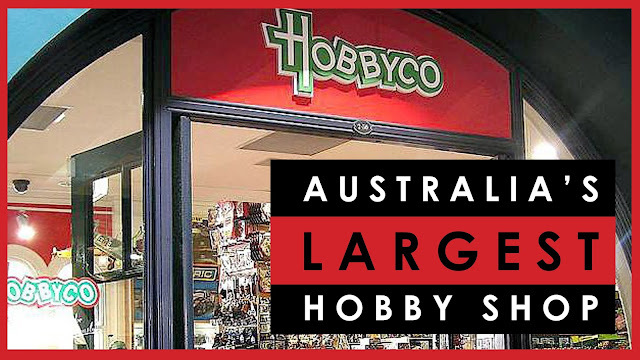 And importantly, since it is a flagship example of a large Australian hobby store, how does it compare to Japanese model shops? 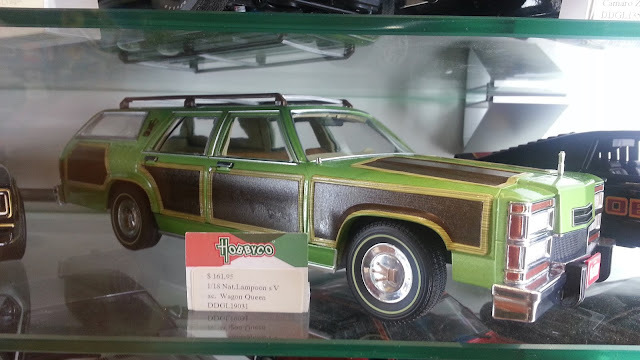 The range of model kits is good - it's bigger and more comprehensive than what is on offer here in Melbourne. I would say the model range compares favourably with Japanese hobby shops. Where it disappoints compared to Japanese stores is in the range of tools and aftermarket detail - I would say there is 90% less tools available, and there is no resin or photoetch available in a normal Australian model store. This is a massive difference to the eclectic stuff available in Japanese shops. 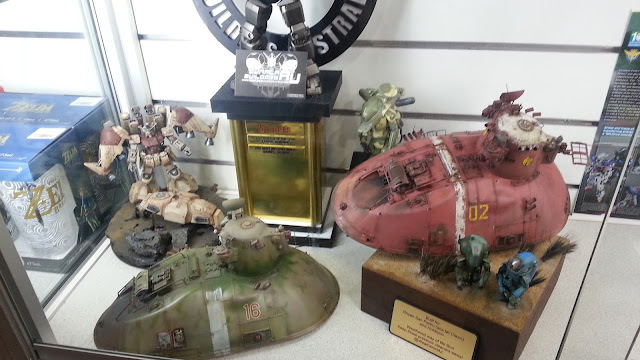 A surprisingly large range of Maschinen Kreiger and Sci-Fi in general. 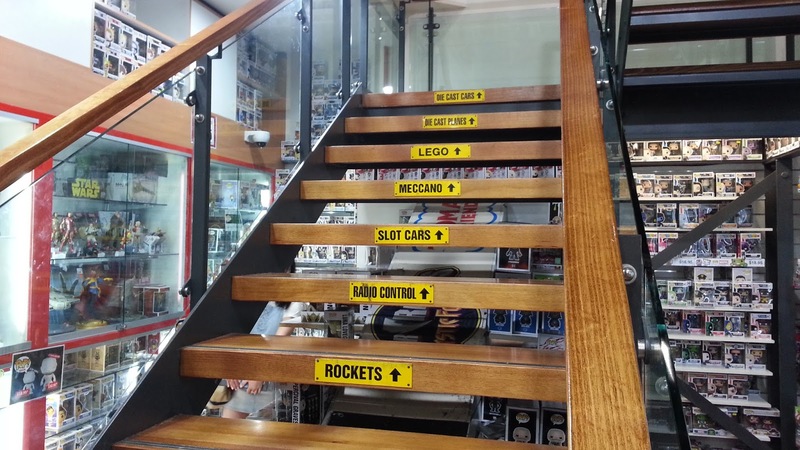 Upstairs for all non-scale model goodies. I was rather taken with the Griswold family truckster from "National Lampoon's Vacation"
Price is the second main difference. We here in Australia pay very high prices compared to model builders in Japan or America (I can't comment on Europe's prices). I get it, I get it - I want the people running the store to make a profit and remain a viable business, I hate seeing hobby retailers close down (I've written about it before). I also know that Australia is a long way away from the rest of the world, and stuff has to be shipped a long way to reach us. I get it. But comparing the prices, I also get why the internet is killing off bricks-and-mortar hobby shops here in Australia. I don't know what the solution is - as a customer I try to support my local stores, but at these prices it really hurts. The only real consolation is that in Japan, although the locally-manufactured kits are crazy cheap, they pay a really hefty price for non-Japanese manufacturer kits - WingNut Wings kits, for example, are about 50% more expensive in Japan than in Australia. So swings and roundabouts, there are pros and cons for us all. So this is (for now at least) the last of my videos visiting hobby shops. Now it's time to get back to actually building models rather than just talking about them! Visiting HobbyCo in Sydney, Australia's largest scale model hobby shop. I see frequent grumbles on YouTube about how pricey models are in Australia, but I’m yet to find an internet or eBay seller that is markedly cheaper than my local place (you’d know them, the good folks in box hill) once shipping is factored in, even if you buy several at once. Could anyone recommend some good value sites, as an Australian, where I could buy models from overseas? I find tanks quite expensive so tend to stick to planes. Yes, shipping is the killer, isn't it? I have heard that hobbylink Japan is a good solution with okay postage (https://hlj.com/) but I can't vouch for having used it myself.